CLICK HERE TO BUY GOOD QUALITY HOT TUB JETS! Who doesn’t love going in a hot tub? They’re relaxing, fun, and humans have been enjoying them since ancient times! Yet, many don’t learn about the maintenance and upkeep that goes into owning one. But did you know that keeping your hot tub jets in good condition can help you to enjoy your unit for years to come? Your jets say a lot about how the rest of your unit is functioning. When they don’t work well, it indicates that something is wrong elsewhere in the system. In this article, we’re going to talk about why jets are crucial to your unit and why you need to take care of them. That way, you can get the most out of your unit without any future headaches. To keep your jets in the best possible condition, it’s important to take consistent care of them. So, let’s find out how! People tend to overlook their jets because they underestimate their overall purpose. Though the jets may seem trivial, they’re not. In fact, they’re the reason why you enjoy a warm and relaxing water massage from time to time. And they’re also helpful in letting you know how your unit is doing altogether. But because people don’t understand their purpose, people don’t clean them as well as they should. Each part and component need to work properly so that the entire unit functions. But when they clog up with dirt, calcium, and other debris, they’re not as efficient. And you’ll be able to tell when you go to sit in your unit for a massage. The water will feel like a bath, but the jet power will be dull. So now, we’re going to discuss how to clean hot tub jets – the simplest way! We’ve broken the cleaning process into 5 easy steps. After reading and going through the steps, taking care of your hot tub jets will become an easy routine. First, drain the water. This may seem tedious, but the only way to do a thorough job is to soak the nozzles separately. While the water is draining, refer to your manual guide. There are different types of hot tubs, and the jet removal process varies according to type. But overall, this process can be difficult. The difficulty will depend on how often you remove and clean your hot tub jets. If you haven’t removed them in a while, expect the nozzles to be more stubborn to remove. You can use an adjustable wrench to remove them. Make sure your grip is firm – but not so tight that you damage them while loosening. Then, turn the wrench to the left (or counter-clockwise), and loosen each unit. Once they’re loose, pull them out slow. Wrench not required, but still having a hard time removing them? Put on some latex gloves to improve your grip. Once you’ve removed the nozzles, separate the damaged ones from the working ones. Place the ones you’ll reuse in a large bucket. Next, mix up a solution of water and white vinegar. White vinegar is a safe cleaning ingredient that people have been using for decades. It’s a classic deodorizer that removes bacteria and keeps hot tub jets looking brand new. The vinegar will also fight residue build-up and prevent clogging. Plus, vinegar is better and safer for your hot tub than commercial cleaning products. The cleaning solution should be 1/4 cup of vinegar for every cup of water. You can also try a 50/50 solution for a more thorough cleaning, especially if you haven’t cleaned them in a while. The water doesn’t need to be boiling, but it should be warmer than room temperature. Pour and mix the cleaning solution into the bucket holding the nozzles. Soak them for 3-4 hours so the vinegar can remove any tough residue and mineral build-up. Every hour, stir up the bucket. This helps to penetrate and loosen calcified deposits. Some people choose to pour and mix a gallon of vinegar in with the old water. While this seems quick and practical, it won’t allow the vinegar to do its job. After the nozzles have soaked, rinse them off. Use the cloth to wipe away any excess residue. Next, you’re going to clean the interior of your hot tub while the nozzles soak in the white vinegar solution. You may be wondering what the interior has to do with the hot tub jets. To explain, we’re going to talk about bacterial contamination. Because they’re smaller than swimming pools, hot tubs have higher concentrations of bacteria. People tend to think that spa water is hot enough to kill bacteria. But this couldn’t be further from the truth! It turns out that hot tubs can be quite unsanitary! When they’re not cleaned on a routine basis, they manifest into bacterial cesspools. And your jets can aid the contamination process. As infectious bacteria festers in the pipes, they blast through every time you turn on the jets. Infectious indeed. 18,000 Americans get hospitalized with the bacterial infection, Legionnaire’s, every year. And many of these cases are caused by dirty hot tub jets! So, not only can hot tubs become gross. But they can pose a serious health risk to everyone who enters them. The best time to clean the interior of your jet system is while the nozzles are soaking. What’s the best way to clean them? Some companies market pour-in cleansers that flush harbored bacteria out of the pipes. But running white vinegar and diluted bleach through will suffice. You can use your small brush to scrub residue off the gears, as well as the jet pipes. You should also scrub down the jet threads to prevent the spread of bacteria. 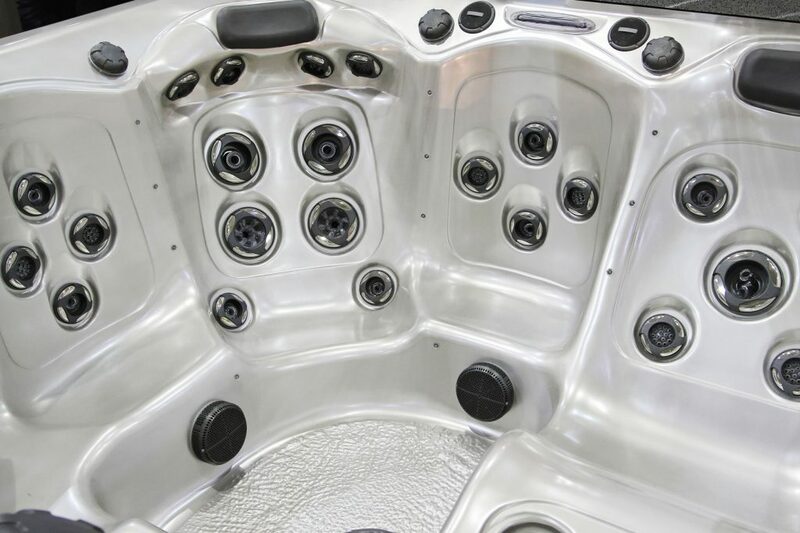 Before tossing away the damaged units, make sure you buy replacement hot tub jets. They need to be the right size so they screw back on. When screwing back on, align the threading properly. Misalignment can cause damage, especially when you go to turn on the jets. Take the wrench and tighten the nozzles back in place. Turn the wrench to the right (clockwise) until the nozzles are back on snug. Install replacements using the wrench. Refer to your owner’s manual if you’re not sure which type of nozzle you need. After assembling everything back together, turn on the water. You want to test and make sure that everything is working properly. When enough debris accumulates over time, it causes wear and tear to the rest of your unit. And if you don’t clean them enough, you could end up having to buy a brand new set. Not to mention, your unit can make you sick if you don’t clean and sanitize it enough! So keep them clean – and turn the cleaning process into a maintenance routine! You should clean your hot tub jets at least 5-7 times per year, no matter how often you use them. Not sure how to tell when they need cleaning? A good way to know is to test for hard water. Hard water is another term for water with a high mineral build-up. Over time, minerals like calcium and limestone can accumulate in the water and your jets. Residue accumulation in and on your jets is not the only thing that can go awry. There are a number of things that can go wrong, but it’s often hard to diagnose the problem. Not feeling the same massage as you did when you first installed your hot tub? Excess air could be to blame! Sometimes air gets trapped in the pump after you’ve refilled your unit. This can cause the pump itself to lose the ability to push water through. To fix this, loosen the coupling on the pump’s pipe, but don’t remove it. Then, turn on the pump. You’ll be able to hear the air push out. Once the air is expelled, water will start to pump through. This signifies that the excess air is gone and that you can tighten the coupling back up. Your hot tub jets are supposed to pump water through in a blaring motion. But when the flow of the water pulsates or moves in a throbbing motion, it can indicate a few things. Check the water level and make sure it’s filled enough according to your unit’s manual. If the water level is too low, it can cause air to pump through the jets. Next, check your filter. If the filter is dirty, it can clog and obstruct the water flow. Remove and clean it, and don’t forget to replace it from time to time. Not sure why the water pressure is weak? Don’t be afraid to call a technician. If there’s a problem like a blockage, the pump may need replacing. If you don’t know how to, it’s best to call a professional to avoid further complications. Having trouble finding a technician who specializes in hot tubs? Check with your local pool store representative for recommendations. The little things do go a long way! Everyone who enters must rinse off before entering the tub! Though it seems like a pain, it can prolong the need to clean, as well as keep harmful particles away. A quick rinse with soap will not only wash away bacteria and harmful residue. It will also wash away chemicals from makeup, deodorants, and other cosmetics. You should also ask anyone suffering from illness or diarrhea to not enter your unit. While bathing caps aren’t necessary, be cautious with long hair around your hot tub. Longer hair can drift off and get caught up in the pipes. We’ve talked about how blockages in the system can weaken your hot tub jets. But it can also cause bigger problems for your unit as a whole. You can prevent blockages by requiring those with long hair to pull it up. Keep extra hats and hair ties around just in case. Owners should already be checking their hot tubs’ chemical levels – at least – twice a week. Excess chemicals not only damage the unit but harm those who enter it. Avoid using pool chemicals like liquid chlorine. These types of chemicals are not only highly acidic. They can also increase the likelihood of hard water, which can damage your hot tub jets. You should also avoid adding spa products to the water. If any of these chemicals are slightly too high in concentration, they can be hazardous. While test strips are necessary, you can also monitor the water with your senses. If the chemicals smell strong, or if you can see calcium or residue build-up, it’s time to switch out the water. After adding chemicals into your hot tub, keep the cover off for at least 15 minutes. Doing so prevents the off gases from circulating around. Keeping the cover clean can prevent excess dirt and mildew from accumulating in your hot tub jets. Plus, the cover can produce a musty or funky odor over time. The best way to clean your hot tub cover is to with a bleach and water solution. You only need a very small amount of bleach in the solution. Make sure to clean the inside and outside of the cover. This should be done every couple of months, or whenever it’s dirty. If you have an outdoor hot tub, make sure to brush away puddles off the cover after rain showers. Doing so will not only prevent contamination but keep bugs away. And most importantly, keep the cover on whenever the hot tub is not in use. Hot tub jets play an important role in the health and function of your unit. By staying on top of your maintenance regime, you can avoid problems and enjoy your hot tub for years to come! Not sure which hot tub unit is right for you? Hot Tub Advice is here to help! This entry was posted in Pool & Tub Maintenance on March 4, 2018 by Luke. I like your advice to hire a professional for larger repairs, such as if you need to replace the pump, in order to prevent the issue from getting worse. When choosing a professional, you might want to research local contractors so you can learn about their spa services and determine which one can help with your situation. Choosing a local contractor could give you the chance to contact them if you ever require their repairs again so you can keep your hot tub in the best condition.